Depending on where you are, fire seasons may start a whole month earlier than they did in the early '80s. Places like California are no stranger to wildfire, but in recent years the blazes have grown bigger and more unpredictable. They're also starting earlier and burning later — experts say the shifting climate is making wildfire season last longer than ever. Through the past few decades, the warming climate has extended this fire season all over the world. Since 1980, about one-quarter of all of Earth's vegetated surfaces have started experiencing longer fire weather seasons. When temperatures are hot and there's less moisture in the atmosphere, fires are more likely to start. When winds are high and there's little chance of rain, fire is more likely to spread. In some pockets of the U.S., these environmental shifts can add two more days to fire seasons every year they occur. 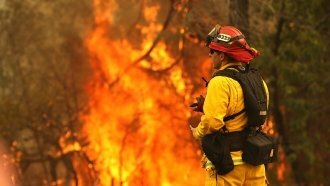 Scientists find that in California and other parts of the West, these effects have compounded to the point that fire seasons start about a month earlier than they used to 30 years ago. And so far, 2018 is no exception. Fires have already burned more than 4 million acres of U.S. land, nearly 14 percent higher than the recent average. The Forest Service expects an above-normal season to continue through October for parts of the U.S.